Yes, it does look like another "aftermath", doesn't it??? Sassy pictures herself jailed in the dungeons of the Bastille already. 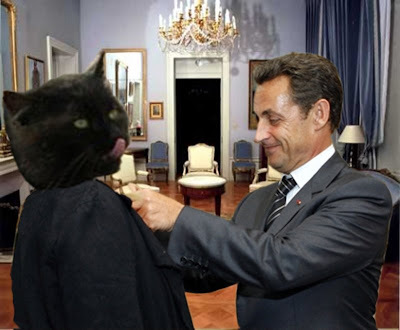 ...and Sassy is bestowed the Legion of Honor Medal by French president Sarkozy!!!! 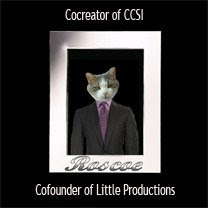 And of course, there will be another CCSI, with Opus as new CEO of Little Productions and directed by Ruis. So watch out for the audition notice! What a happy ending to the party, but oh, Sassy, we're going to miss you. But we wish you the best and happiest of retirement years. 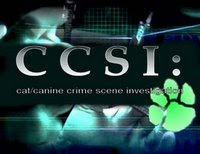 We will watch for the coming CCSI 6. We're sure Opus will be a more than capable CEO of Little Productions. What a grand exit. We've figured out, by now, that we should have expected no less! It's obvious Sassy'll be missed. And always loved and remembered. We're glad we could be a part of at least a bit of her life's experiences. A fitting exit for the bestest CEO. Here's wishing the best for a safe retirement. You will be greatly missed and I dearly hope you will come back for a visit. Look forward to the next production under Opus! Were the Pooses for Peace there? I know that they like to glom onto valuables. Anyway, I am happy that the party ended joyfully. Farewell, Sassy. I hope that you are having a whole new happy life ahead of you. What a wonderful send off. 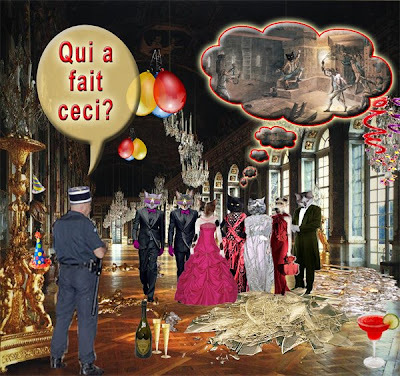 Thanks so much all for stopping by and for Karl, Momo, Asta, Opus, and Olive for throwing me this fantastic party. 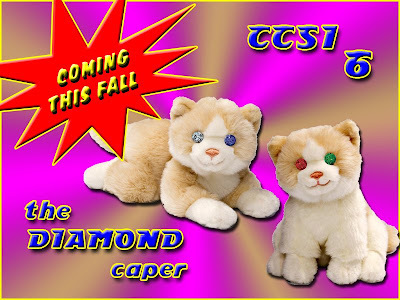 I can now retire knowing that the paws of CCSI are in the greatest paws there are. The next show is in the works! Love and peace to all of my old friends and the new ones that I met on this last adventure. My final post will be at my place on Friday. Did Sassy retire or join the CIA? We bets she is working undercover somewhere exotic. Hope she comes home soon and tells us about her adventures. It looks like you all really had a fun retirement party. I wish I could have gone but maybe the next time. Someond had to stay behind and watch over things. I'm having the time of my life..Sassy desewves all the accolades and honows that anyone can pin on hew.she is and always will be a vewy special pawt of ouw lives. I'm going to go twil awound the dance floow. 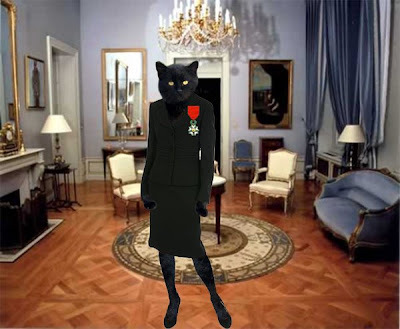 Sassy, on your blog you described yourself as "A Tiny Cat With Big Dreams." I think you know yourself very good because you made those Big Dreams true in every way. 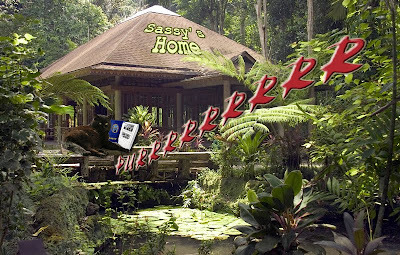 We, all your friends, are honored and proud that we were part of your dreams, Sassy!! On this last day I want to thank my husband and my friends for the outstanding and superb organization of these 5 days!! I tremendously enjoyed it (and not only because I was with Karl ;), I had the bestest time with all of you and loved every minute of it! 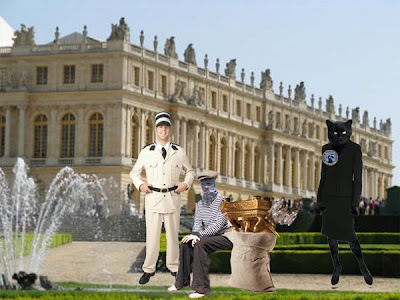 Oh my...we just read all of the adventures in Paris...you kitties...renting out VER SIGH...oh my...we dogs would never of thunk of it!!!! Oh Sassy...the grace you've brought to CCSI, not to mention you wardrobe...actually, we just realized that when we think of you we think of the word GRACE...and now Gracie is lookin' after your mom...life can be a cirle, can't it? Dear Sassy!!! We hope you have a wonderful retirement and live as you want !!!!! We will miss you and all of the things you have done. You are a super duper cat!!!!!! !